When reviewing the Melodiya reissue of Prokofiev's The story of a real man recently I commented favourably on the improvement of the presentation of their operatic discs, with the added hope that this was not simply a 'one-off'. Well, these reissues of two Rimsky-Korsakov one-act operas do now come with more detailed synopses, and the standard of English translation has improved considerably. Sadly we are still not provided with texts or translations, and in the case of Mozart and Salieri with its closely argued plot this lack remains serious. However, unlike some of the rarities which Melodiya have been reissuing over the last couple of years, help is at hand on the internet where English translations of both works can be found fairly readily. That for Mozart and Salieri comes in the form of a reproduction of the booklet from an earlier Chandos recording of the work (CHAN9149); whether copyright has been complied with I do not know. Vera Sheloga can be had in Russian, in transliteration, and in English, although in separate files in each case. 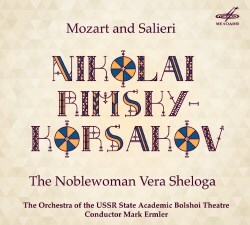 The scores are also available on the valuable ISMLP site although that for Vera Sheloga comes in Russian only, and the vocal score for Mozart and Salieri - although the title page suggests that this is a French edition - has the original Russian and a singing translation in German. So, still not ideal, but better than in some earlier issues in this series. These two operas make an ideal coupling on CD, and it is odd that nobody else seems to have thought of it before. Both have been available separately in various previous issues: Mozart and Salieri in the Chandos version referred to above, although the singing in that issue is nothing like as resplendent as we are given here. Vera Sheloga was to be had in a Capriccio issue which appears to have vanished from the current listings, although in its original version it came with texts and translations. If Capriccio do reissue that disc, I fear that they may well jettison these - as they have done with many others of their valuable recordings. Once again, the singing of this new reissue need fear no odious comparisons with its later rival, even if the latter is in some ways better recorded. Of the two works, Mozart and Salieri is probably the better known, although neither are precisely standard repertory. The text is taken from a brief play by Pushkin, and enshrines the legend that Salieri was responsible for poisoning Mozart - as the older and delirious composer confessed on his deathbed. As such the plot has close parallels with Peter Shaffer's play (and film) Amadeus, although the later drama has much more psychologically argued dialogue than Pushkin's more basic study of professional jealousy. There have been a surprising number of recordings of the work since as far back as 1947, including versions in Russian, French, German and English. The first generally available issue was an EMI LP issued in 1980 which subsequently found its way onto a Berlin Classics CD. This featured Peter Schreier and Theo Adam, and was sung in German. The recording reissued here emerged on LP in 1988 and was for a period available on CD on the Olympia label. Neither of these issues survived for long in the catalogues, and for some time the only available version was that on Chandos, which also appears to have now disappeared. Current listings comprise a live video recording dating from 1981 and another audio version included in Brilliant's Rimsky-Korsakov edition. I have heard neither of these although I have at various times owned the Chandos and EMI versions. Quite apart from the fact that it is the only single-CD audio version, the reissue currently under consideration is by some degree the best rendition of the score I have come across. Nesterenko was at the time one of the greatest exponents of what one might call the 'Chaliapin repertoire' of Russian bass parts, and he is excellent too as the jealous composer who has the lion's share of the musical interest in this opera. Mozart in Pushkin's hands is not the character that Schaffer presented in Amadeus, and the almost insipid goody-goody that we have here does not do much to attract our interest. That said, Alexander Fedin does all he can with the part and sings with a nice sense of lyric line but all their efforts cannot disguise the fact that much of the action is contained in the recitative-like setting of Pushkin's text. Without a close understanding of that text the musical rewards can be distressingly slim. The recording places the voices rather forward from the orchestra, but Mark Ermler allows us to hear most of the detail although the chorus singing passages from Mozart's Requiem are if anything too distant. On the other hand there is none of the unnatural highlighting that sometimes afflicts Soviet recordings from this era. The opera Vera Sheloga, an 'off-cut' from the full-length The maid of Pskov to which it forms a prologue, is much more of a rarity. The only rival recording in the current catalogue is a version contained in the Brilliant Rimsky-Korsakov complete edition which has been available at times on various CD labels including Fidelio and (as noted) Capriccio. This new version was issued on LP by Melodiya in the late 1980s, but never appears to have materialised on CD before. It is a full-blooded score which fares better in the hands of Mark Ermler than with Capriccio's Stoyan Angelov; and the Russian singers here have the edge on Angelov's Bulgarians. The orchestral sound on this Melodiya reissue also has a sense of presence that is lacking on the alternative, although the voices are again over-forward in the balance which does bring out some gustiness in Tamara Milashkina's singing. So, although we could still wish for a better standard of presentation from Melodiya, this release is still to a large degree self-recommending. At least in the case of these operas copies of the text can be obtained on-line. Is it too much to hope that Melodiya can build on their booklet improvements by making texts and translations available on their own website? After all, if budget labels such as Naxos and Brilliant can do this, it should not be beyond the resources of Melodiya with their considerably higher asking price. Our joy would then be complete as we could appreciate this valuable series of reissues better, which is even more important.